More than 3989 people are serving IPP (Imprisonment for Public Protection) sentences in British prisons. Five years since the sentence was legally abolished, thousands still languish in jails with no release date. Parole board delays, prison overcrowding, and sheer neglect is leading to unprecedented rates of prisoner suicides and self-harm. 80% are over tariff and desperate to be free. THIS FORTNIGHT IS FOR THEM. The time is now to escalate and generate unrelenting pressure on the government, prison profiteers and the parole boards who are all complicit in ripping families apart, ruining lives and killing working class young people who have died as a result of the mental strain of being an IPP. This fortnight of action is dedicated to Charlie Noakes, an IPP prisoner who died on the 23rd July 2016 as a result of prison neglect and the despair of this sentence. Let’s make this an amazing fortnight of action in honour of the life HMP stole. Days of action at local Probation Offices. Find your nearest office in the directory here. …. The options are endless! Not connected to anyone locally? Get in touch! Smash IPP may be able to connect you with local contacts and prisoner families. 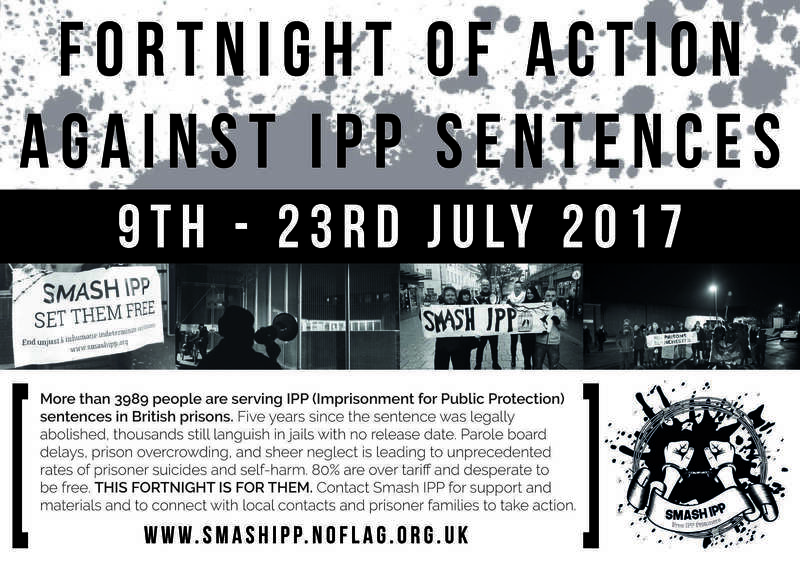 Know an IPP prisoner who would benefit from some solidarity actions as part of this campaign? Or would like to have letters from people showing support? Let us know! Smash IPP can help with leaflets, stickers and other materials. We are also available to do talks and workshops about IPP if needed or can link you up with people that can. Please contact us with your any of your publicly advertised plans so we can help promote them, otherwise don’t forget to send us your action reports.